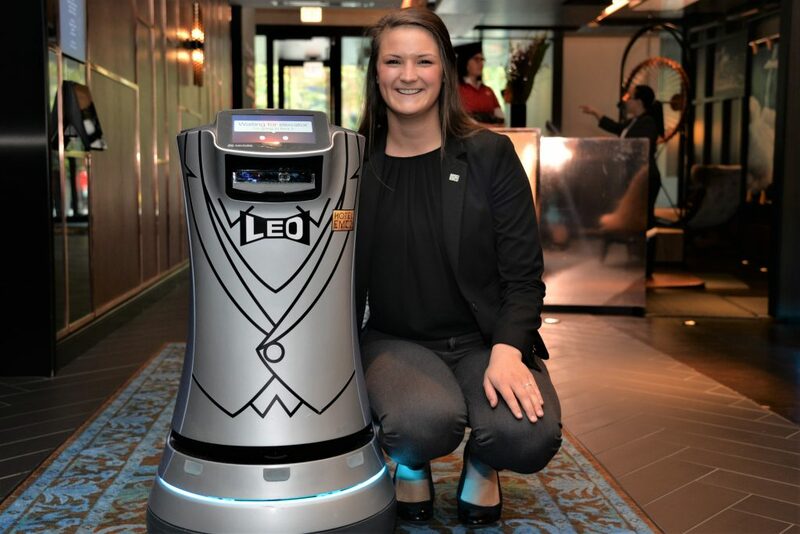 Allyson Murphy (BUS ’15) is front office manager at Hotel EMC2, a boutique hotel that features two robots, Leo & Cleo, who work as personalized assistants to guests. The new art-and-technology theme of the hotel appeals to millennials. Millennials are predicted to become 50 percent of all travelers in the Unites States by 2025, according to study by the Cornell Center for Hospitality Research. When they do travel, members of this generation are increasingly staying at boutique hotels in their quest for personalized, authentic and technology-driven experiences. 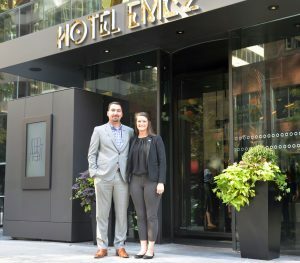 To find out more about this trend, we talked with Allyson Murphy (BUS ’15), front office manager, and Alexander Foster, director of rooms at Hotel EMC2, a boutique hotel that opened in the Streeterville neighborhood of Chicago in May. Founded by Lincolnshire-based SMASHotels and part of Marriott’s Autograph Collection, EMC2 has a millennial-appealing, art-and-technology theme that is inspired by scientist Albert Einstein. In addition to working at EMC2, Murphy and Foster, who both previously worked for Starwood Hotels & Resorts, share their knowledge of the lodging industry as mentors for students in DePaul’s School of Hospitality Leadership. Q: About what percentage of your clientele are millennials, aged roughly 20 to 35? Foster: Almost half of our guests are millennials. We find that we attract a wide variety of travelers from all walks of life. Q: How does the hotel’s theme and decor appeal to experience-seeking millennials? Foster: Our guest rooms feature many different touch points for experience-seeking travelers. My favorite is the phonogram, which allows our guests to amplify music from their phones. Q: Millennials are technology savvy and socially connected, and they expect the same from the hotels where they stay. How does EMC2 address their expectations? Foster: No one has time for phone calls anymore, our guests included. We implemented a text-messaging platform that we found makes communication less intrusive for our guests and allows for a quicker connection. 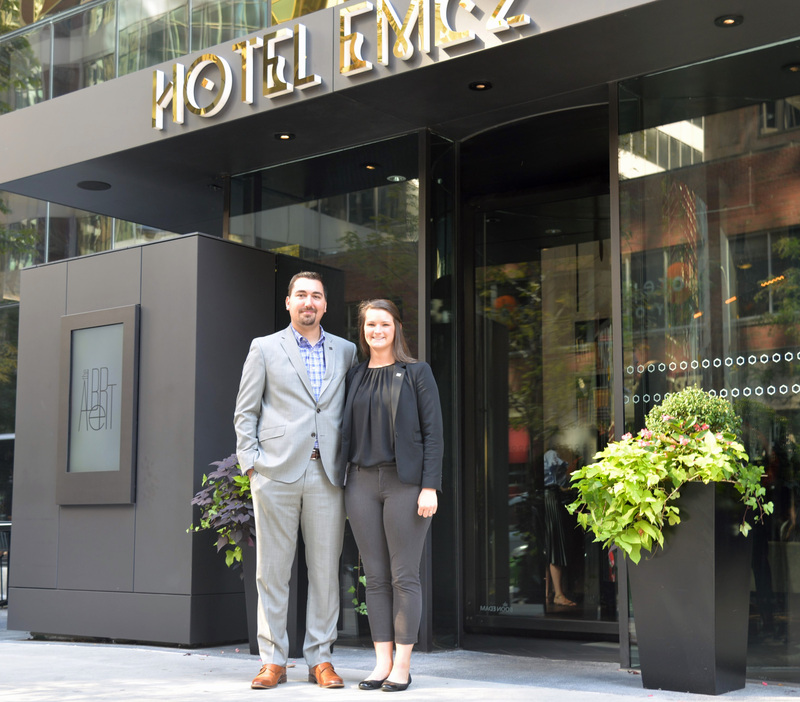 Alexander Foster, director of rooms (left) and Allyson Murphy (BUS ’15), front office manager at Hotel EMC2, a Chicago boutique hotel. The hotel has an art-and-technology theme that appeals to millennials. Murphy: Each guest room features an Amazon Dot (Alexa) that can connect to our Guest Services team. You can ask her almost anything, including restaurant recommendations, for any forgotten items, or even just to say ‘hi’ to our robots, Leo & Cleo. Q: What services does EMC2 offer that appeals to millennials’ desire for unique, authentic and personalized experiences? Foster: Our property features two robots, Leo & Cleo, that work as personal assistants. The experience of having a robot come right to your door with towels or welcome amenities is truly unlike anything else. Murphy: One of the most authentic elements of Hotel EMC2 is our staff. Our Door Attendant team starts out guests’ experience from the minute they walk in the door. They tell the story of the hotel and show off each unique feature of our guest rooms. Our team is also knowledgeable about local art and science exhibits in the city. 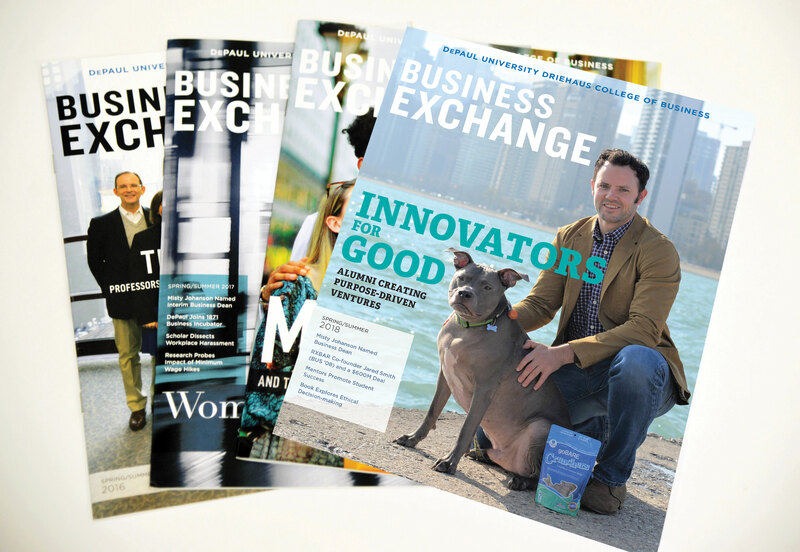 Q: How is food and beverage at EMC2 designed to meet the preferences of the millennial market? Foster: Our restaurant, the Albert, features globally inspired food, crafted by Executive Chef Brandon Brumback. His ever evolving menu consists of only the freshest local ingredients that are currently in season. Murphy: Not only can our guests dine in our beautiful, library-esque dining room, but they can have that same experience in the comfort of their own guest room. Our guests can view the menu with ease on our interactive TV platform. 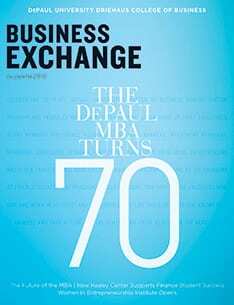 Q: Social consciousness and sustainable practices are important to many millennials. How does EMC2 support this? Foster: With a focus on building the best possible team to deliver the best possible service, we partnered with Heartland Alliance, which actively helps refugees from all over the world. They have an incredible hospitality program, which trains their students to work in hotel operations and prepares them for a future in hospitality. Murphy: Hotel EMC2 believes that creating is universal and innovation is the key to the future. Our team fulfills this vision through its partnership with Project SYNCERE, with a percentage of each reservation booked going directly to students studying in the STEM field. Q: As student mentors at the School for Hospitality Leadership, what advice do you have for students and recent alumni who are entering the hospitality field? Foster: Network! You never know who will become your next potential boss or coworker. The hospitality world is incredibly small and well-connected. Take advantage of every opportunity to interact with industry professionals as everyone has a unique piece of knowledge that they can share with you. Murphy: Have an open mind and be willing to take on any role! Each experience is a unique opportunity for you to learn something new. Foster: With all of our technology, it’s easy to forget our beautiful art that is everywhere in the hotel. Each of our meeting rooms, Emmy Noether (named for the German mathematician) and Symmetry, feature a unique custom piece created by our Resident Scientist Eugenia Chang. In Emmy Noether, Eugenia brought Emmy’s theory to life with a visual representation of her conservation of movement theory. In Symmetry, the concept and real-life instances of symmetry are displayed across the front of the room. Murphy: From the novel we leave on the night stand in each guest room to the zoetrope in the lobby displaying artistry and angular momentum, we give travelers “Instramagable” moments throughout the entire hotel. The hotel encourages our guests to come together to appreciate art and science in a non-traditional way.